I received a copy of this book for review consideration from the publisher. This post uses Amazon affiliate links. Introverts! Have you always known or understood your introversion? Aaron Caycedo-Kimura didn't so when he took a test (Myers Briggs Type Indicator) and learned he was it was like everything in his world fell into place. 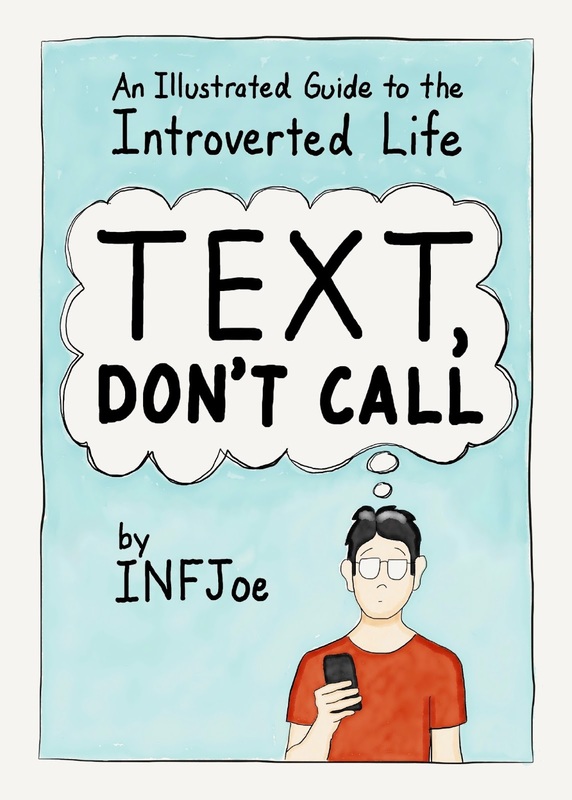 Thanks to the glorious marvel of the Internet, he hopped online and began sharing little cartoons about being an introvert and now he has a book! And it's a cute little gem of a book for introverts. 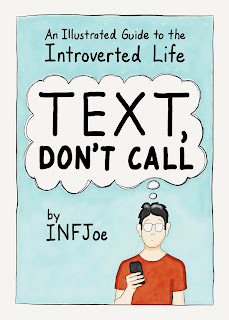 Text, Don't Call's subtitle is: An Illustrated guide to the Introverted Life and that's just perfect. This isn't a book that gets into the deep nitty gritty of life as an introvert, but it does offer a quick run through of what it means to be an introvert and provides many assurances that it's okay to be an introvert. I like how he explains that extroverted qualities are idealized and it certainly makes sense why it's that way given the nature of the personality types. But as an introvert myself, I do think it's important to understand and to learn to accept the particular strengths of being introverted. Text, Don't Call pokes fun at introversion in a charming relateable way through the illustrations. The comics are cute and in most cases felt pretty spot on! He even captured several little moments you've experienced as an introvert but maybe never expressed before. In addition to the charming illustrations, there are little tips for navigating life as an introvert. Everything from holidays to finding people who understand you, you can find it in this book. He draws inspiration, I think from the hashtag, #introvertproblems which I've never checked out before, but I'm going to have to since I think I'll probably be able to relate to a lot of it! I think this is a fun read for any introvert but also would make a great gift for a young introvert in high school or college that you know. That's about the age you start realizing who you are as a person and having a fun little book like this would be a great relief and comfort.